It seems as if we’ve been waiting forever for the second Dubai based Rixos property to open and last month it did, to rapturous applause. 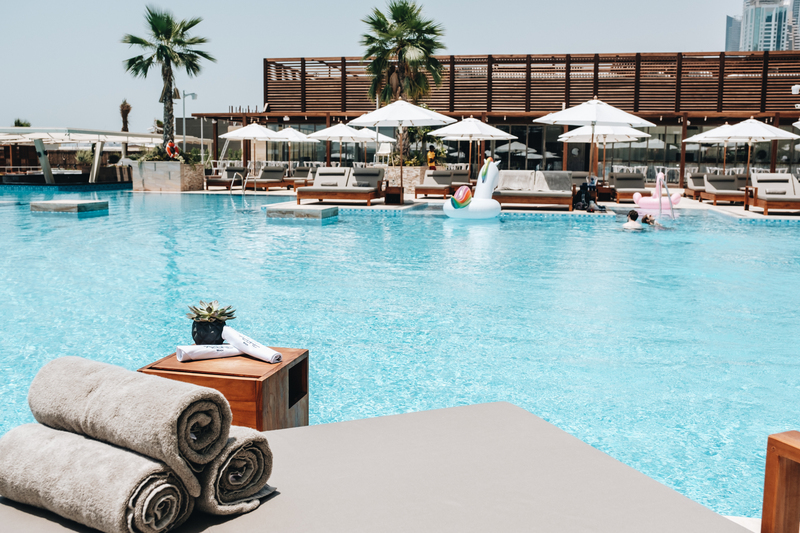 Alongside it’s sleek five-star hotel design comes the emirate’s latest beach club and its a beauty. Geared towards the more laid-back of lazing in the sun days (as opposed to an all-out party), Azue Beach is a destination within itself. Taking inspiration from the white-washed architecture and glistening turquoise Mediterranean Sea, Azue Beach is the shore-side hangout on everyone’s lips right now. Located directly in front of the Rixos Premium Dubai on JBR, Azure Beach caters to both residents and hotel guests as well as being open to paying visitors. Impossibly stylish, Azure Beach has relaxation and rejuvenation its in core; a world away from the bustle of street life behind it. It’s Mediterranean charm is framed by the beautiful Arabian Sea, offering a range of poolside facilities such as a poolside lounge and a chic chill out shisha terrace. Of course, the pièce de résistance is the stunning infinity pool adorned with private island beds and boasting views out towards Palm Jumeirah and Bluewater’s Island. A secluded sandy beach area makes for the perfect playtime for both adults and little ones alike and the fun-filled on-site kid’s club makes Azure Beach Dubai’s only true family-friendly beach club. Tuck into fresh seafood from the Asian fusion inspired menu as you sit back and relax whilst dreaming of the Med.